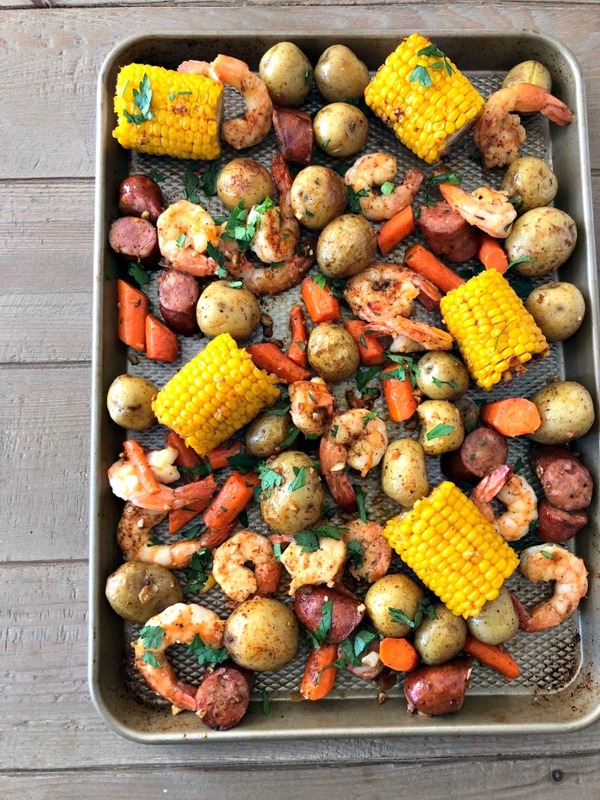 Easy Sheet Pan Shrimp Boil - A Life From Scratch. Speaking of enjoying things, last night we most definitely enjoyed our dinner OMG. 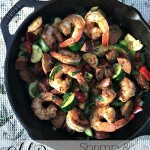 Did anyone else make the easy sheet pan shrimp boil from the weekly meal plan? 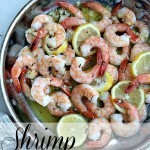 It takes all the work and fuss out of doing an actual big shrimp boil and simplifies the process to one easy tray. You par boil the potatoes and corn to give it a head start and then everything roasts away together in the oven mixed up with butter, Old Bay seasoning, and of course, all the garlic. So good. So easy. And so fun to lay out on a table with some crusty bread! This would be a great entertaining dish, if you happen to be having any friends over this weekend. If not, make it just for yourselves as I did. The boys loved the sausage and potatoes. There was a little something something for everyone in this recipe. I added carrots simply because I love roasted carrots but I realize they are not apart of the true shrimp boil routine. Eh, it’s ok to shake things up once in awhile, right? 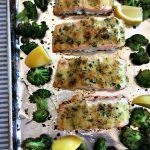 Preheat oven to 425 degrees F. Lightly oil a baking sheet or coat with nonstick spray, or use foil for easy clean up! In a small bowl, combine melted butter, garlic and Old Bay Seasoning. Place potatoes, corn, carrots if using, shrimp and sausage in a single layer onto the prepared baking sheet. Stir in butter mixture and gently toss to combine. 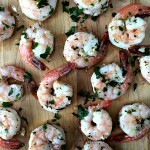 Serve immediately with lemon wedges, garnished with parsley and smoked paprika, if you’d like. Ahem….I “suppose” this makes up for missing out on The Big Event each year, haha! It sure does look yummy either way!! Ha, I know we fail at life! Hopefully we can make up for it the rest of the year.